Each business or enterprise has different priorities, threat environments, and risk tolerance. This makes the development and application of a standardized scoring mechanism difficult, because the assumptions of the mechanism may not match those of the enterprise that is applying the scoring. CWRAF attempts to minimize this difficulty by allowing users to model environment-specific considerations within the framework. These considerations are then reflected in the formulas that produce customized CWSS scores, which can then be used to identify which weaknesses are most important. A major function or service that includes the operations and interactions of a broad range of networked capabilities or organizations from the public and private sector; government and military; commercial and nonprofit organizations; academia, etc., that are enabled or controlled by software/IT and require some degree of resilience and security in transactions or operations. Examples include Finance, e-commerce, Public Health, Emergency Services, telecommunications, etc. A collection of inter-related, similar technologies that together provide a set of features that are used to solve a class of problems, possibly across a variety of domains. Examples of technology groups include web technologies, embedded real-time systems, storage, operating systems, etc. A general type of technical capability, component, system (or system-of-systems), or architecture that is commonly used to support the mission of a particular organization. Examples include a web application, database, smartphone, SCADA, etc. An archetype may be used within multiple business domains. For example, SCADA systems are used in electrical power grids, manufacturing, oil and gas transmission, and other domains; and many industries manage their information using database-connected web servers. A shareable, semi-formal description of a scenario that identifies a set of connected archetypes that collectively perform a function within a business domain. 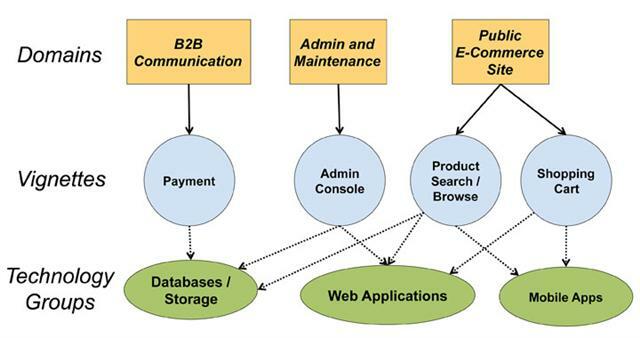 A description of the security-relevant assets and interfaces within an individual vignette, combined with the security priorities of the business domain. The BVC forms a bridge between the business domain's security concerns and the technical impact of potential weaknesses that are found within that domain. A list of the potential low-level effects of weakness exploitation (e.g., code execution or system crash), along with the layers at which exploitation could occur (e.g., application or network). Each "technical impact" is given a subscore based on how the impact could affect the performance of the business function outlined by the vignette, in light of the security concerns as defined in the BVC. The data from the Technical Impact Scorecard is then used to influence the calculation of CWSS scores. The following table highlights the kinds of technology groups and business domains that are being investigated using CWRAF. Note that a vignette can cross multiple domains (e.g., the use of end-point computing devices in Shipping & Transportation, Public Health, Homeland Security, etc.) 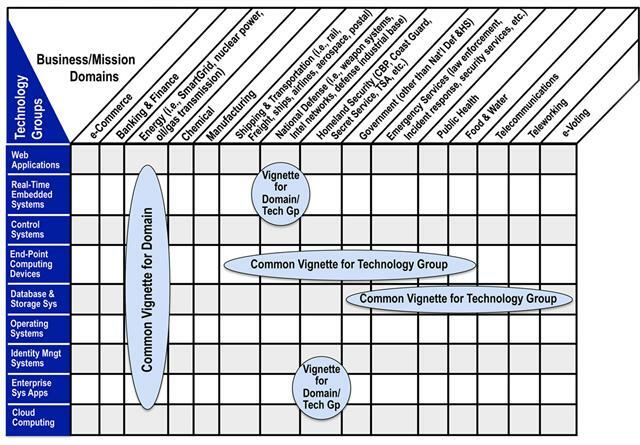 A vignette can also utilize multiple technology groups within a single domain such as Energy, in which the Smart Grid uses many different groups. An up-to-date version of this matrix highlights which vignettes have been defined and are under active development. Note: CWRAF users are not restricted to using such large-scale domains and technology groups. 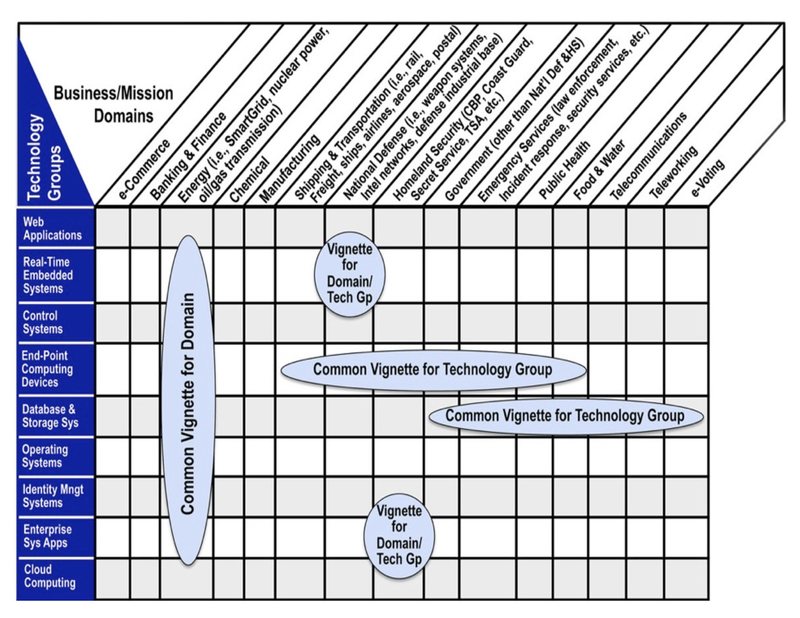 CWRAF can be customized with user-defined domains, technology groups, and vignettes. Within CWRAF, a business domain typically covers a major industry or sector that includes the operations, processes, and interfaces for a broad range of connected organizations, capabilities, or services that are enabled or controlled by software and require some degree of resilience and security in transactions and operations. Information and communication technologies (ICT) cut across all domains. Following is an example list of business domains. This list is being actively reviewed and modified. The full, up-to-date list of domains is provided in more detail on a separate page. e-Commerce The use of the Internet or other computer networks for the sale of products and services, typically using on-line capabilities. Banking & Finance Financial services, including banks, stock exchanges, brokers, investment companies, financial advisors, and government regulatory agencies. Shipping & Transportation Aerospace systems (such as safety-critical ground aviation systems, on-board avionics, etc), shipping systems, rail systems, etc. Emergency Services Systems and services that support first responders, incident management and response, law enforcement, and emergency services for citizens, etc. eVoting Electronic voting systems, as used within state-run elections, shareholder meetings, etc. Within CWRAF, a "technical archetype" is a class of technical capability, system (or system-of-systems), or architecture that is commonly used to support the mission of an organization. Examples include a web application, web server connected to a database; Service-Oriented Architecture; Real-time, Embedded Device; end-point computing devices (such as a Smartphone); process control system (such as SCADA); etc. A technical archetype may be used within different business domains. For example, SCADA systems are used in Energy, Chemical, and other domains; and many industries manage their information using database-connected web servers. Technical archetypes can be used in multiple business domains, and certain archetypes may inherit certain classes of weaknesses. For example, a web-based archetype may always have cross-site scripting (XSS) as a concern. However, an archetype may have varying importance depending on the business context. For example, a database archetype that contains a retail customer's financial information and order history may have different security concerns than a database that contains sports statistics that are intended to be read by anyone. Note that the definitions and usage of archetypes are still under review, and this concept may change in future versions of this paper. They do not play an explicit role in CWRAF 0.8, although this may change in future versions. Following is an example list of archetypes categorized by their technology group. This list is being actively reviewed and modified. The full, up-to-date list is provided in more detail on a separate page. Web Applications Web browser, web-server, web-based applications and services, etc. Industrial Control Systems SCADA, process control system, etc. Real-time, Embedded Systems Embedded Device, Programmable logic controller, implanted medical devices, avionics package. End-point Computing Devices Smart phone, laptop, personal digital assistant (PDA), and other remote devices that leave the enterprise and/or connect remotely to the enterprise. Hosted applications or capabilities provided over the Internet, including Software-as-a-Service (SaaS), Platform-as-a-Service (PaaS), and Infrastructure as a Service (IaaS). General-purpose OS, virtualized OS, Real-time operating system (RTOS), hypervisor, microkernel. Office products such as word processing, spreadsheets, project management, etc. A vignette provides a shareable, formalized way to define a particular environment within a business domain. It includes the role that software archetypes play within that environment, and an organization's priorities with respect to software security. It identifies essential resources and capabilities, as well as their importance relative to security principles such as confidentiality, integrity, and availability. For example, in an e-commerce context, 99.999% uptime may be a strong business requirement that drives the interpretation of the severity of discovered weaknesses. Vignettes allow CWRAF to support diverse audiences who may have different requirements for how to prioritize weaknesses. CWSS scoring occurs within the context of a vignette. (2) the security priorities of the business domain with respect to the potential outcomes that could occur if those archetypes are successfully attacked. A Technical Impact Scorecard connects the business concerns in the BVC with the possible technical impacts that could happen if an attacker can successfully exploit the weakness, such as code execution, reading of sensitive application data, or a software crash. For each potential technical impact, the scorecard assigns a subscore and provides a rationale for the assignment of the subscore. When a CWSS score is calculated for a weakness, the data from the Technical Impact Scorecard is used to influence the score to reflect the requirements as described in the BVC. A selection of example vignettes is presented below. These vignettes were selected to represent diverse communities and use cases. Note that these vignettes are subject to change or removal based on community review. A more extensive, up-to-date list of vignettes is provided on a separate page. Note that the Technical Impact Scorecard is omitted from this example for the sake of brevity; more details are available in a later section. E-Commerce Web-based Retail Provider Internet-facing, E-commerce provider of retail goods or services. Data-centric - Database containing PII, credit card numbers, and inventory. BVC: Confidentiality essential from a financial PII perspective, identity PII usually less important. PCI compliance a factor. Security incidents might have organizational impacts including financial loss, legal liability, compliance/regulatory concerns, and reputation/brand damage. Banking & Finance Financial Trading / Transactional Financial trading system supporting high-volume, high-speed transactions. BVC: High on integrity - transactions should not be modified. Availability also very high - if system goes down, financial trading can stop and critical transactions are not processed. Medical devices - "implantable" or "partially embedded" in humans, as well as usage in clinic or hospital environments ("patient care" devices.) Includes items such as pacemakers, automatic drug delivery, activity monitors. Control or monitoring of the device might be performed by smartphones. The devices are not in a physically secured environment. BVC: Power consumption and privacy a concern. Key management important. Must balance ease-of-access during emergency care with patient privacy and day-to-day security. Availability is essential - failure of the device could lead to illness or death. Devices are not in a physically secured environment. Energy Smart Meters Meter within the Smart Grid that records electrical consumption and communicates this information to the supplier on a regular basis. BVC: Confidentiality of customer energy usage statistics is important - could be used for marketing or illegal purposes. For example, hourly usage statistics could be useful for monitoring activities. Integrity of metering data is important because of the financial impact on stakeholders (consumers manipulating energy costs). Availability typically is not needed for real-time; other avenues exist if communications are disrupted (e.g., site visit). Teleworking Remote Access Server Remote Access Server used to support employees working outside the enterprise, including teleworking/telecommuting. Archetypes: Embedded Device, Endpoint System, Removable Storage Media, Proprietary Firmware. BVC: Strong authentication and authorization is desired. Emergency Management First responder First responder (such as fire, police, and emergency medical personnel) for a disaster or catastrophe. BVC: Communications and Continuity of Operations (COOP) are essential, so availability is extremely important. Integrity is needed to ensure that the correct data is being used for decision-making and communications, such as status updates and contact lists. Confidentiality is, relatively speaking, less important. E-Voting State Election Administration using DRE State Election Administration using DRE (Direct Recording Election) machines. BVC: Integrity essential to election terminals as well as endpoint systems used in pre-election device programming. Protecting PII less important than ensuring accurate vote tabulation and audit trails. Physical security of devices also essential. Help America Vote Act (HAVA) requirements mandate paper audit logs for use by election officials. Security incidents might facilitate fraud via malicious influence of election process or outcomes as well as incur Federal regulatory concerns, & erosion of voter confidence. National Security Weapon system sensor Sensor for a weapons system that is connected to the Global Information Grid (GIG). BVC: Integrity is essential to prevent reporting of false data and faulty decision-making. Lack of availability could cause mission failure. Confidentiality may be slightly less important. In addition to a summary, each vignette is annotated with additional, lower-level details that can be used to describe how the technical aspects of weaknesses relate to the business or mission-level requirements. These details are discussed in another section. Disclaimer: these vignettes are in the early stages of development and are intended primarily to demonstrate the concept. They are subject to review and feedback, and they may be modified. An up-to-date list of vignettes is on a separate page.